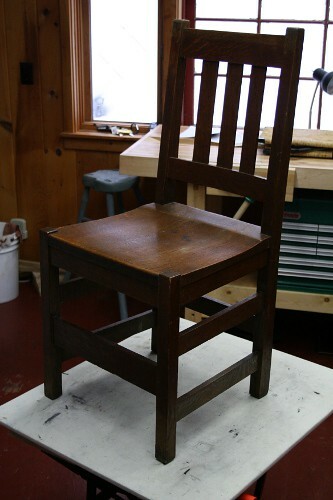 One of the most common repairs that comes across my bench is re-gluing of chairs. When you think about it, a wooden object with twenty plus joints which is sat on, leaned on, jumped off of, and put through manifold other abuses is a prime victim for failure. We ask a lot of our chairs. The following is a walk through of a complete reglue of a Mission Style side chair. First step is to do a thorough evaluation of the piece to make note of any irregularities that may affect the process. Label each and every joint with painter's tape using whatever number or letter system suits your fancy. In the evaluation of this piece, I noted doweled joints on the crest rail and front legs. It is now that these need to be carefully drilled out. The real goal here is to remove the dowel with absolutely no damage to the surrounding wood. This is done by placing a center mark with an awl, then beginning to drill from a small size bit (1/8" or so) up to you reach the edges of the dowel hole. (Make sure you mark the desired depth with masking tape on the bit to prevent going through the other side.) Note I did not say the biggest bit used would necessarily be the exact size of the dowel. As you are drilling out, you may find yourself slightly off center as you go. This is immaterial. All we are doing is removing this wood. Once you have used the bit large enough to be just shy of the edge of the hole, then use a narrow chisel (I used an 1/8") to knock out the rest. Needle nose pliers may be employed to retrieve fragments left in the hole. When all pieces of the dowel are knocked out, you may carefully place the exact size bit into the hole and, with vise grips holding it, slowly twist to clean up edges. Once all holes are drilled out, we proceed to disassembly. Make sure all screws are removed, labeled, and kept track of. I place them in a tackle box divider tray with a lid for safe keeping during the process. For disassembly, I find Quick Grip Reversing Spreader Clamps unmatched. These provide an even and firm pressure with excellent padding giving maximum control. (Their light weight is a boon in this application as well.) For stubborn joints, a mild jolt from a plastic dead blow mallet may help to fracture the old glue line. Again, finesse and common sense is to be utilized here. We are not beating the chair to pieces. A calm thump is all that is needed. Once all the labeled pieces are disassembled, we proceed to cleaning off the joints. Any larger pieces of old glue may be gently removed from the tenons with a rasp. Do not remove any wood but only the glue. Following up with 100 grit sandpaper to clean off remaining glue is next. To scuff the inside of the mortises, I wrap a piece of adhesive-backed 100 grit around a pencil or flathead screwdriver. After every mortise and every tenon is cleaned up, we move on to a dry run assembly. This is to ensure we have a complete understanding of each step of the gluing process, seeing as the glue is usually not very willing to wait for us to figure out our oversights in the midst of the event. When the chair has been assembled dry with clamps in place, we should now have good confidence to proceed with glue up. 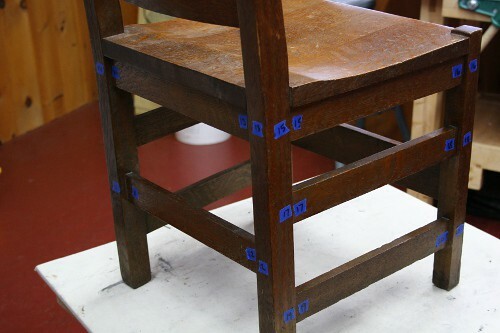 Assembly is to be done on a level surface so that the chair does not rock on uneven legs after all is said and done. Apply glue inside mortises and onto tenons. This is called 'double-spreading'. Clamp firmly. The balance between the amount of glue applied and clamping pressure should yield a thin line of glue squeeze out. No line and you may not have had enough, gobs pouring out and you over did it. No real problem in the latter case as long as it is cleaned up before it is hardened. Make sure all squeeze out is cleaned up before it has a chance to set up. Both hide glues and PVA are cleaned up with water. Another technique I use is to wait until the glue gels a bit and then you can pop it off with the edge of a ruler or like utensil. During glue up, hardwood dowels can be replaced, cut as close to surface as possible, and pared flush with a chisel. Color touch-up will probably be necessary to blend new dowel into chair's patina. Once all is assembled, leave clamped for at least an hour and ideally overnight. Do not stress joints for 24 hours. Hope this quick walk-through has proved helpful to you in your restoration adventures. Patience, steady hands, and the right tools are the three paramount components to a successful repair. Be well and have fun. Fine work...always good to see work well done. My daughter has a child's chair that my wife used as a child herself, and the chair is now wobbly. I want to disassemble it and re-glue it. Your post appeared serendipitously at the *perfect* time! Thank you! Your welcome Fredrico! Hope all goes well! Joshua, I just found your blog a few days ago, and I have enjoyed looking through each of your posts. The chair re-glue walk-through is well written. Thank you for sharing this information with your readers. You do fine work. Thanks, Ronald. It's a pleasure to have you by. Feel free to browse around and comment whenever the urge strikes. Dialogue is great! It seems that chairs tend to break often. I am just glad that a chair has never completely broken when someone was sitting on it. Hopefully that will continue.